Part five of our six-part series takes a look at TIger’s core communication tools: Address Book, iCal and Mail. They not only keep you in touch with the world, but also provide the means to keep your busy life organized. Here’s a simple but useful tip—you can use Address Book’s Smart Groups feature to organize your Address Book entries. into the next field. Click on OK to create the group. Once you’ve used Address Book’s Smart Groups feature to build a dynamic list of related contacts—for example, everyone on your daughter’s soccer team—you might find it useful to be able to send an e-mail to everyone in that smart group. Tiger’s Little Black Book Address Book lets you create a tabbed hard copy of your electronic contacts, for times when you can’t get to your computer. Want a printed copy of your Address Book—maybe to keep in the car for emergencies? In Tiger, Address Book offers four printing templates for outputting contact details to paper: Envelopes; Labels; Lists; and Pocket Address Book, which produces a small tab-style address booklet. Go to Print and choose Pocket Address Book from the Style menu. 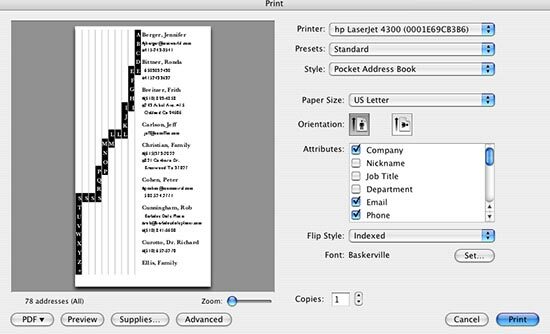 Set the Paper Size setting to US Letter and choose the contact attributes—Company, E-mail, Address, and so on—you’d like to include for each contact (see “Tiger’s Little Black Book”). You can now choose to have birthdays that you’ve recorded in Address Book appear in iCal. To create a birthday entry in Address Book, select Address Book: Preferences, click on the Template tab, and choose Birthday from the Add Field pop-up menu. After closing the Preferences window, add the birthdays of your nearest and dearest. Now launch iCal, select iCal: Preferences, click on the General tab, and enable the Show Birthdays Calendar option. iCal will display a new Birthdays calendar. Birthday Wishes If you’d like more warning of iCal birthday events, try iCal-Alarmist. Like Address Book (with its smart groups) and the Finder (with its smart folders), the new version of Mail lets you create smart mailboxes, which update themselves based on rules you define. For example, you can create a smart mailbox containing only messages that you received in the last week and that had attachments.